What is pot rice ? It is a popular one-pot meal in southern China. Rice and water are added into an earth pot, just as one would make any plain steamed rice. When the rice is about half-done, most of the water will have either been evaporated off or absorbed into the rice. Marinated meat, fish or vegetables will then be added on top of the bed of rice. With the cover on, cooking continues for another few minutes before the heat is turned off. The whole pot is allowed to stand for 10 minutes or so before serving, thus allowing the meat and rice to be thoroughly cooked through inside the pot. How to use a bamboo steamer ? When you're ready to use a bamboo steamer, pre-clean it with some soap and water. Wipe dry with a towel. For meat, seafood or saucy dish, use a heat-proof dish to contain the ingredients, before putting into the steamer basket. For vegetables, buns or dumplings, placing one or a few pieces of broad-leaf vegetable at the bottom of the steamer basket, before placing the food to be steamed. The whole steamer basket can then go in a wok of boiling water for steam cooking. You can steam cook using more than a steamer basket at the same time. Just alternate the positions of the stacking at about half-way for even cooking. Is it better to use a stainless steel steamer or a bamboo steamer ? 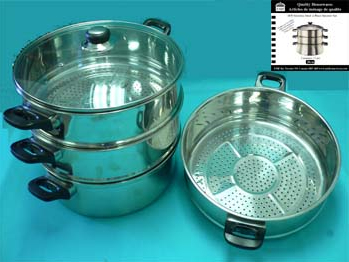 A steamer basket can either be made of bamboo or stainless steel. A stainless steel steam boiler is a utensil especially made for steam cooking (See picture). It has more than one stainless steel steamer basket inserts that can go on top of each other and the base pot. Stainless steel is more durable. Bamboo is more environmentally friendly. It is a choice of the consumer's. Business Hours: Mon. - Fri. 9:00 a.m. - 5:00 p.m ET. Copyright 2008 - 2012 Loci Company. All rights reserved.